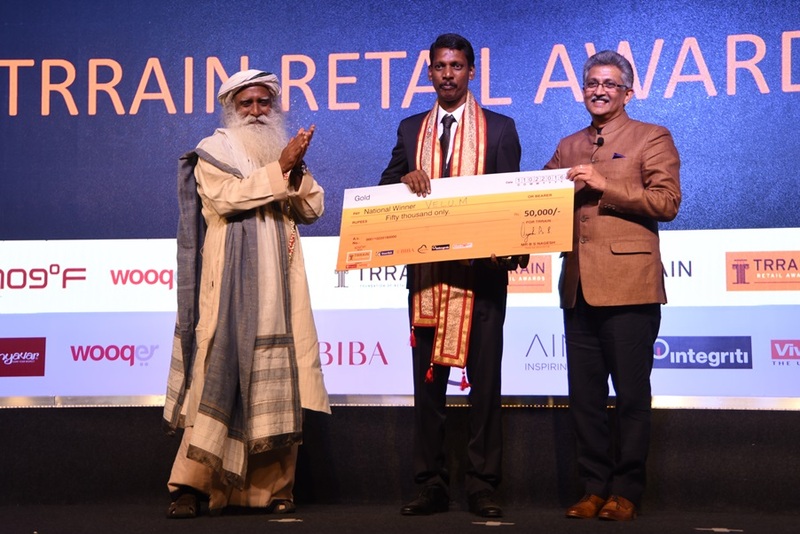 The TRRAIN Retail Awards, which recognises exemplary customer service by Retail Associates (sales staff), was graced by Sadhguru, Founder of the Isha Foundation. The award ceremony that was held on February 11, 2016, in Mumbai, recognised 6 Retail Associates as the National Winners out of the 15 Retail Associates who were awarded as the Category Winners at the Regional Level. The key highlight of the TRRAIN Retail Awards was an insightful discussion of Sadhguru with Padma Shri Awardee Mr. Piyush Pandey, on Customer Service Excellence. The glittering awards ceremony saw the stalwarts of the Indian Retail industry in attendance and an enthralling performance by the popular musical group Maati Baani. The TRRAIN Retail Awards recognises and rewards customer service excellence (both modern and traditional retail), at an all-India level and creates industry case studies and benchmarks for customer service excellence in retail in India. The initiative judges the finest, excellent, enduring customer service story of retail associates (sales staff) in the industry. The winners of the TRRAIN Retail Awards this year are National Winner Gold is Mr. Velu M, Marks & Spencer Reliance India – Chennai, National Winner Silver is Ms. Neelam Parmar, Star Bazaar – Mumbai, National Winner Bronze is Ms. Shradha Mangal, Godrej Nature’s Basket – Mumbai, the Person with Disability (PWD) Award winner is Mr. Guru Francis R, Dominos – Chennai, Being Human Award winner is Mr. Satish Raut, Titan Eye Plus – Varanasi and Integrity Award winner is Mr. Pankaj Gurav, Godrej Nature’s Basket – Mumbai. A new category of ‘HR Initiative’ was newly introduced this year in the TRRAIN Retail Awards to recognise the retail organisations that have created a culture of service excellence and supported the sales associates to outperform and deliver excellence in customer service. The award for the ‘Best HR Initiative for the Year 2015-2016’ was awarded to Godrej Nature’s Basket, Marks & Spencer Reliance India and Future Group- Big Bazaar & FBB. TRRAIN is a public charitable trust formed in 2011 by Mr. B. S. Nagesh, with the vision of Empowering People in Retail and works to achieve immediate and lasting change in the lives of retail associates in India. We are solely committed to upgrading the lives of people in retail, both at work and at home. TRRAIN has undertaken various initiatives to enable retail associates to upgrade their skills through TRRAIN Education Program and build pride and dignity through the TRRAIN Retail Awards and Retail Employees Day. TRRAIN’s initiative on building inclusive retail work force by training and employing People with Disabilities in Retail roles has received tremendous support from the industry.